If you have been reading couponing sites and you have seen deals listed for something called Ibotta but you didn't understand what that was, the following Beginner's Guide will explain how the app can save you money and provide easy steps on how to use it. I also provide a review outlining my personal experience with using the Ibotta app, including what I like best and least about its usefulness in cutting my grocery bills. Ibotta is a free mobile coupon and cash-back shopping app for most iOS and Android devices. With Ibotta, shoppers have the opportunity to earn cash back on select products by performing easy tasks, purchasing the product, then providing proof of purchase. What gives Ibotta an edge in building its popularity among couponers is that the savings gleaned via the app are in addition to the other saving strategies shoppers use, such as redeeming coupons, rewards programs, coupon stacking and matching, rebates and other money-saving apps. This makes it an important inclusion in the couponers' toolbox for savings. Is Ibotta Hard to Use? The Ibotta app is easy to use. There are multiple steps to take so that it pays off, but the steps are simple and the instructions are clear on how to maneuver through the app. To get started with Ibotta, you will need to own a compatible device and have a PayPal or Venmo account. Alternately, shoppers can collect rewards and cash them in to receive featured gift cards from select retailers if that is preferred over the cash option. Ibotta gives users different ways to earn cash back. To begin, you will tap on the Ibotta symbol on your mobile device and that will bring you to the heart of the app, called the "Offers" section. The "Offers" section displays pictures of the products with offers and the total amount of how much you can get back in cash displayed under each product. When you find a product that you are interested in purchasing, tap on the "Earn $--" bar to view the tasks that you need to complete in order to earn the cash back after you purchase that product. You will see that for most products, you have more than one way to earn cash. You can complete one or all of the tasks. The more tasks you perform, the more cash you will get back. Examples of the tasks include reading a fact, participating in a quick poll, watching a short video, posting on your Facebook page, or writing a brief comment about the product. When you complete at least one task per product offer, the product is automatically added to your "Checklist" on the Ibotta app so you can earn money for purchasing the item. Most of the tasks can be completed very quickly and take about the same or less time than it takes to clip and file a paper coupon. In order to get the cash for completing the tasks, you will then need to purchase the products at a participating store (see below). Next, you will want to browse the "Store Extras" section because it has offers that are store specific. For example, Target may have offers that you can only qualify for when you purchase the product at Target. When you have purchased the qualifying products, you will then need to provide Ibotta with the proof of your purchases. Ibotta offers three different methods of proving that you purchased certain products. 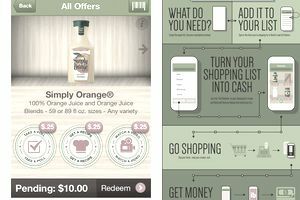 Under the first method, you'll tap "Redeem" at the bottom of the screen, select the store where you purchased the product, then follow the instructions for submitting a photo of your receipt and scanning the bar codes from the products.You must redeem your offers before they expire in order to receive the cash. The second method allows you to link your store loyalty card to the Ibotta app, which will then automatically confirm which items you purchased. However, this option only works with certain retailers and not all of them. Under the third method, you can make purchases within the app or by buying something from one of Ibotta's mobile retailers. In most cases, you won't have to do anything to get rewarded for these purchases, as the app will track them for you. Once you complete those steps, Ibotta will verify your purchase, and when you reach $20, you can transfer the money to your PayPal or Venmo account, or cash it in for a gift card. "Bonuses" are a way for users to earn additional cash. This is a fun section of the app because the more active you are using Ibotta, the more bonuses you will have to unlock. You access the "Bonuses" section from the Main Menu. Tapping on a specific bonus will reveal the details on how you can earn it. When you complete a bonus, you will be given the opportunity to unlock another bonus. Ibotta also pays cash for referring friends who register and open up an account for the first time. To earn these bonuses, your friend should access the registration page using a referral link from you. Typically, you'll earn $5 for each friend who joins, but Ibotta also offers additional friend bonus promotions from time to time in which you can earn extra money if a pre-set number of friends join. All offers have expiration dates, which are displayed in two different places. Once an offer is activated, the expiration date displays on the "Checklist" and on the "Offers" and "Stores Extras" sections. In addition, offers that are set to expire within five days will display an "expiring" flag, which is helpful. Another nice feature of the Ibotta app is the ability to keep track of your earning activity. This includes tracking your receipt submissions, Bonus Rewards and invitations to friends. You can also view how much money you have made by using the app by viewing the "Lifetime Earnings" found in the "Withdraw Cash" section. If you tour around different couponing websites, you will read varying opinions on the Ibotta app, but most of the feedback is positive. Not being a huge app user myself, I found it to be simple and fun. There have been some objections posted about the multiple steps involved to get the rewards, but I found it can all be done fairly quickly and the more you use it, the faster you become at it. I also like that I can snag an offer while I wait at the doctor's office, or anywhere that I'm sitting and twiddling my thumbs. But what I like the most about the app is that since more grocery stores have moved away from allowing double and triple coupon redemption and have become more strict with couponing policies, this is one app that can really increase how much I save on food and other grocery-related items. There is very little "gray" area within the app; in fact, I haven't come across any. The way you earn money back is straightforward -- no gimmicks, no confusion. The loading of the sales receipt and scanning the bar codes also seems to be an area that bothers some people, but after years of cutting bar codes off packages and mailing in receipts for a rebate, scanning all of it is a breeze, other than my spastic tech issues of lining everything up correctly. Besides, now I get to keep my receipt in case I need it for rewards for other products I purchase outside of the app. I also tend to procrastinate and sometimes find myself rushing to redeem my products before the offers expire or digging in the trash for bar codes. It's best to complete this step right when you get back from the store. Currently, Ibotta works in over 300 participating stores, including Amazon, Target, Kroger, Publix, Walmart and many more To see the most current list of stores, visit the Ibotta website. For current users, make sure to check out the Ibotta Blog for current news and new ways to earn more cash.